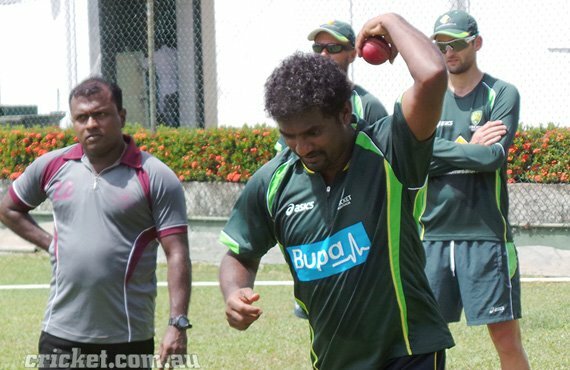 Muralidaran signs with Australia | The International Cricket Hall of Fame. The men’s national side has landed a massive coup with Test cricket’s greatest wicket-taker appointed as a spin consultant. Muthiah Muralidaran, the world’s most successful Test bowler and the Sri Lankan who tormented rival batsmen for almost two decades, will join Australia’s coaching staff to help their bowlers and batsmen decode the conundrum of ‘mystery spin’. Muralidaran, who captured an unsurpassed 800 Test wickets and more than 500 in limited-overs internationals, has signed on as a consultant to join the Australian squad ahead of the Test series against Pakistan in the United Arab Emirates next October. The signing represents not only a significant coup to secure the foremost exponent of the ‘doosra’ delivery that has baffled Australian batsmen and bowlers for decades, and which is likely to play a decisive role in the UAE series with Pakistan’s Saeed Ajmal among the game’s most potent ‘mystery spinners’. It also signals a fundamental shift in philosophy for Australian cricket which, until now, has declined to propagate its own exponents of ‘doosras’, ‘carrom balls’ and the other weapons employed by spinners throughout the globe because of ideological issues over the legality of those bowlers’ actions. As a result, Australian batsmen have struggled to combat the increasingly prevalent craft when pitted against it in the international arena, and the decision to approach and employ Muralidaran is an admission that learning the art from a master is the best solution. “I’m very much excited; I know the Australian team is a very good side, but hopefully I can have a little bit of input to help them do well in the series against Pakistan,” Muralidaran said. Australia coach Darren Lehmann said Muralidaran would work with his team in Australia later this year in a similar consultant role to that filled by fellow spin legend Shane Warne on the recent tour of South Africa. 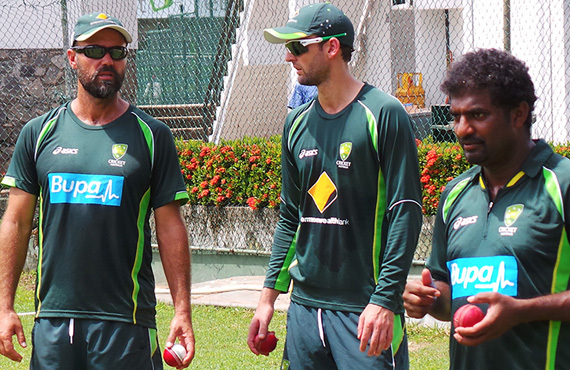 Lehmann said the 42-year-old Sri Lankan, who has endured a famously chequered relationship with Australia since his controversial second Test here in 1995, will also mentor incumbent Test off-spinner Nathan Lyon (who is currently in Sri Lanka working with Muralidaran) as well as other spinners selected for the Pakistan series. The month-long series against Pakistan, with Tests in Dubai and Abu Dhabi that follow a handful of limited-overs fixtures, is expected to favour spin bowlers after Ajmal destroyed England’s batting during their 2012 tour in the UAE, capturing 24 wickets in three Tests at less than 15 runs apiece. “Ajmal is a difficult customer for all the best batsmen in the world, but he bowls a little bit similar to me so perhaps if I can bowl to the Australian batsman it might help a little bit and give them some tips,” Muralidaran said. Lehmann said the opportunity for players to learn from Muralidaran’s skills and insights would provide a huge benefit with series against Pakistan, India, West Indies and Sri Lanka scheduled for the next year or so. “He’s the highest wicket-taker of all time in Test cricket, an off-spinner, obviously we’re going to face someone like that over there (in the UAE) with Ajmal,” Lehmann told cricket.com.au. “It gives our batters a real chance to experience those sort of conditions, how to play that type of bowling with Murali coming on board but also to help Nathan develop his skills. “We’re really excited to have him (and) I know he’s excited, so I’m looking forward to working with him. Lehmann said the idea to approach Muralidaran, who took more than 600 of his 800 Test wickets on subcontinental pitches, followed discussion last year that included team physiotherapist Alex Kountouris, who spent eight years with the Sri Lankan team and remains friends with many of their current and former players. When Cricket Australia approached Muralidaran and outlined the sort of input they were seeking, the world’s most successful spin bowler “jumped on it straight away”, according to Lehmann, and the same level of enthusiasm has been generated among the Australian team. CA’s Executive General Manager of Team Performance, Pat Howard said it was a coup to sign a player of Muralidaran’s unique expertise and unquestioned experience to help Michael Clarke’s men leave no stone unturned in their quest to remain the world’s top-ranked Test team. “We know it’s going to be a tough, hard contest in the UAE against Pakistan on wickets we predict will be friendly for spinners,” Howard said. Muralidaran’s appointment follows recent reports that Indian soil will be imported to enable the preparation of spin-friendly wickets at Cricket Australia’s National Cricket Centre in Brisbane, designed to further improve the national team’s performances in subcontinental conditions. Lehmann said the fact that Australia had won just a solitary Test series in India (the 2004 success in Clarke’s debut series) in more than 40 years highlighted the need to address the nation’s batting frailties against spin bowling and the effectiveness of their spinners on the subcontinent. “One of the biggest things for us is to be successful in the subcontinent (and) we’re playing most of our time in the subcontinent now,” Lehmann said. “If we can have a pitch here (in Australia) that really mirrors that, or pitches – three or four pitches that mirror an Indian, a Sri Lankan, Pakistan background if you like – that makes it easier to have the guys come up (to Brisbane) before a tour, rather than go to the tour earlier, and try and cram it. Almost as confusing as his doosra has been the spelling and pronunciation of Test cricket’s leading wicket-taker’s name. There have been many variations from fans, commentators and the media over the years, with the abbreviated ‘Murali’ the only safe consensus. Now, cricket.com.au has unravelled the mystery by getting the correct details direct from the man himself. Muthiah Muralidaran. That is how the Sri Lankan wants his name to be spelt, so cricket.com.au and Cricket Australia will oblige.